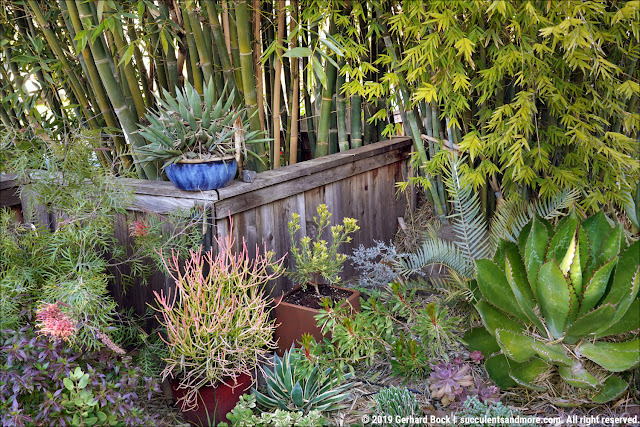 I greatly admire creative minds like Loree Bohl of The Danger Garden or Annette Gutierrez and Mary Gray of Potted. It seems so effortless for them to come up with original ideas for garden containers. 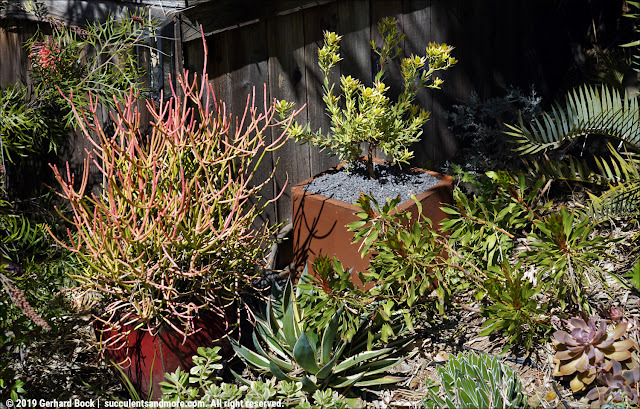 Loree has created dish planters out of birdfeeder tops and has upcycled metal odds and ends in a variety of ways, and Anette and Mary have written an entire book on the subject. My ambitions are decidedly more pedestrian, but that doesn't take away from the excitement I feel when I complete a project, even a modest one. 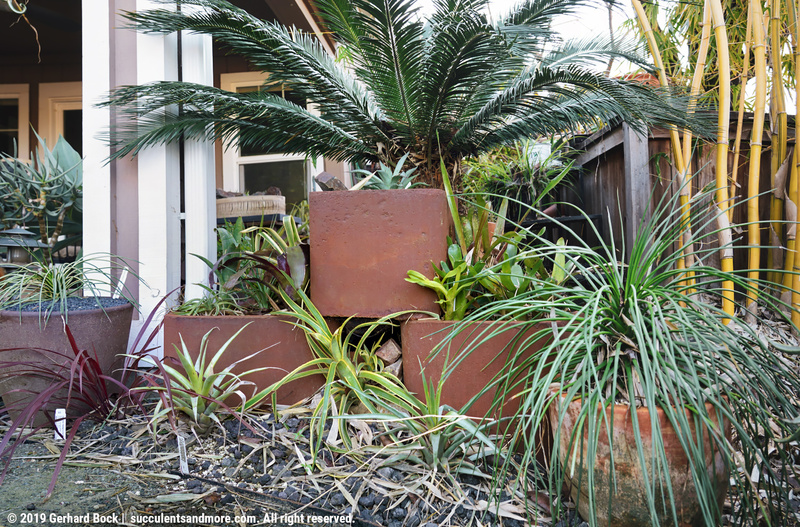 Over the last few years we've been adding Corten steel containers to the front yard to introduce some much-needed vertical elements and gain planting height. I love the rich look of rust that weathering steel like Corten develops over time, but metal planters are pricy. I've finally found an alternative that has much of the same look with just a fraction of the price tag. 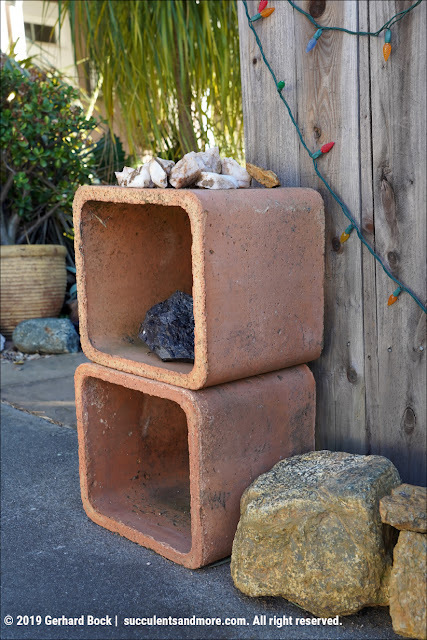 These planters are clay chimney flue liners. You can find them new in a range of sizes and shapes in building supply stores. My enterprising mother-in-law, an enthusiastic garage saler, found six of these for next to nothing last summer. 12" tall and 13" wide, with a wall thickness of 1", they're perfect for what I had in mind. 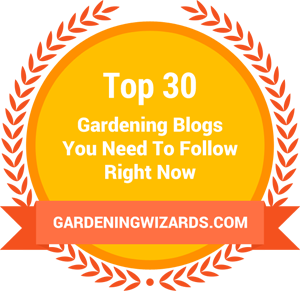 Because they're open at the bottom, plants are able to root into the ground while their crown is a safe distance from any water that might puddle after a heavy rainstorm. 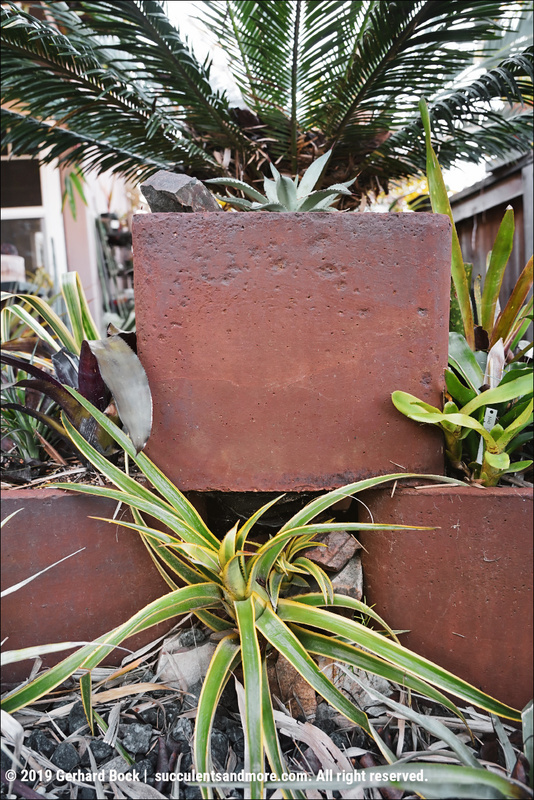 The walls of these flue liners are so thick that even extended exposure to direct sunlight shouldn't heat the soil to dangerous level. To get even more height, you can stack them (or buy taller liners). 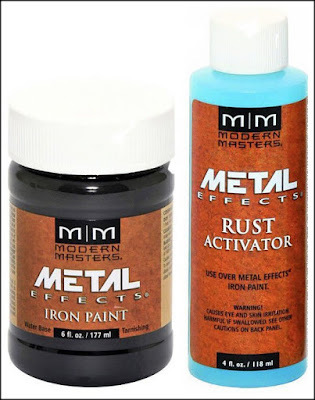 The materials I used are readily available online: oxidizing iron paint, as well as rust activator to get the oxidization process going. The manufacturer, Modern Masters, has several types of metals/colors: bronze (tarnishing to blue), copper (tarnishing to green), and iron (tarnishing to rust red). Over time, the orangish hue matures to a reddish brown—a bit more chocolatey than real rust but close enough for me. One 16 oz. 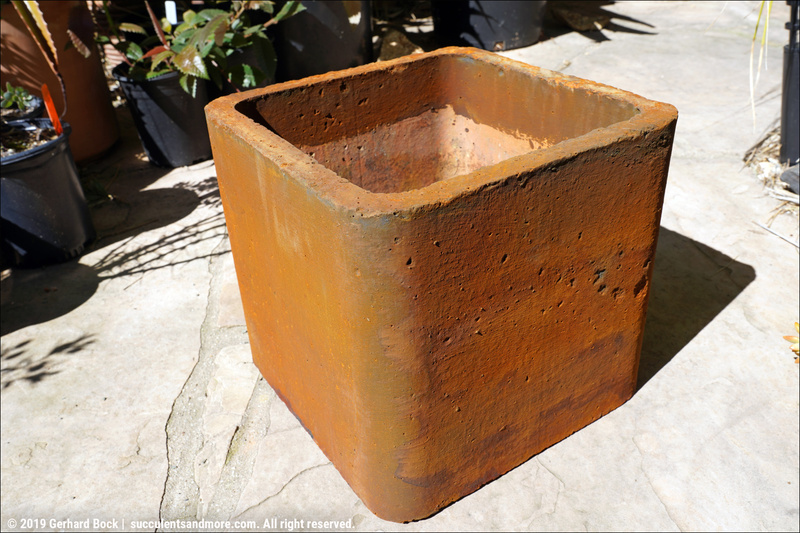 bottle of the oxidizing iron paint ($20) was enough for five 13×12" flue liners. A 16 oz. bottle of the rust activator ($18) should be enough for 10 liners. That's less than $6 per finished piece, in addition to the price of the flue liner. Since the walls are so thick, plants are likely to be much happier than in metal containers, even when using panels of Styrofoam for heat and cold protection. It's now home to a Leucadendron 'Little Bit', a true dwarf with showy flowers. I'll post an update in a few weeks when the flowers are their peak. That's a great idea. As the skunks are now having regular digging parties in my bromeilad bed, I need better defenses to thwart them and the flues look like they'd be a nice complement to the rocks I already have. Skunks! Dear lord, and I thought squirrels were bad! 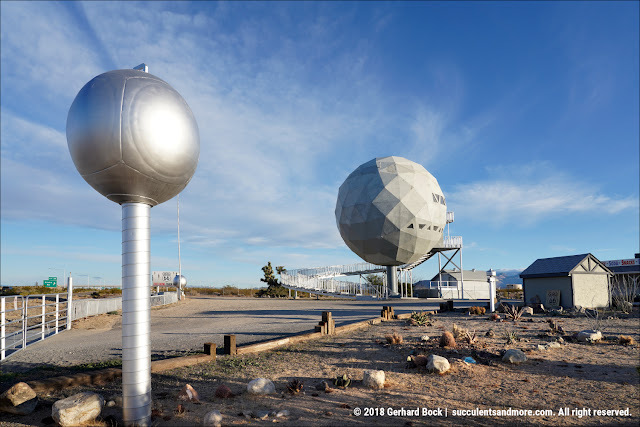 That's outstanding, Gerhard! 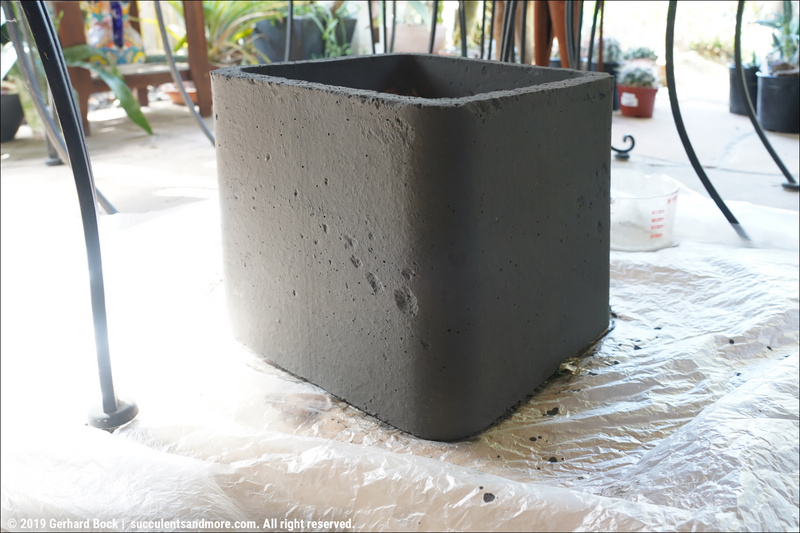 In cooler-summer dry areas, the matte charcoal color might also be useful and stylish by itself (sans rust activator). 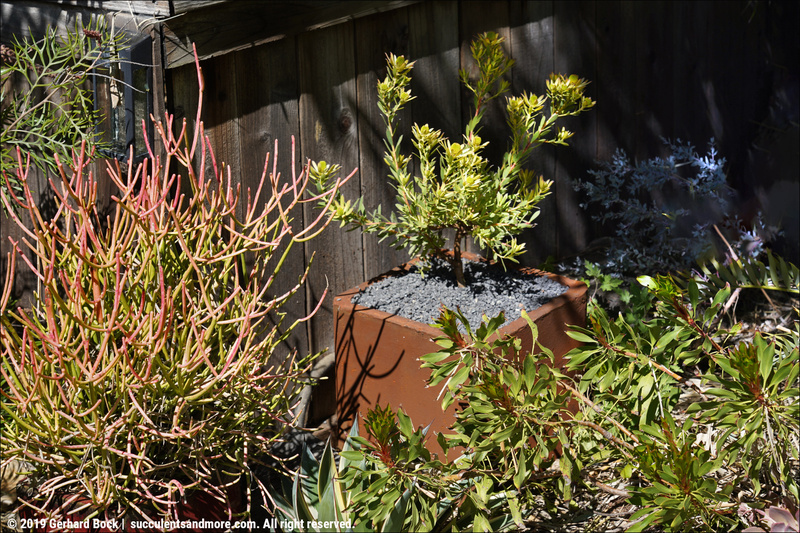 I'm glad you mentioned the styrofoam panels used inside steel planters, because I've been wondering for a while how even heat-adapted plants handle being in a metal planted without being cooked. Some Corten containers come with Styrofoam insulation (esp. by Veradek). For others, I would highly recommend some sort of protection. It gets sizzling hot in an uninsulated metal container. Seeing how the walls are a full 1" thick, I imagine they'd hold up very well. You should get one or two to try. Kudos to finding an attractive but affordable alternative. They fit into the garden beautifully. A lot of really cool stuff often seems only destined for the rich and famous. Thank you! Habitat for Humanity ReStores or similar stores are a good and cheap source for supplies. "I love these," she said. Swoon. Great DIY with very stylish results. 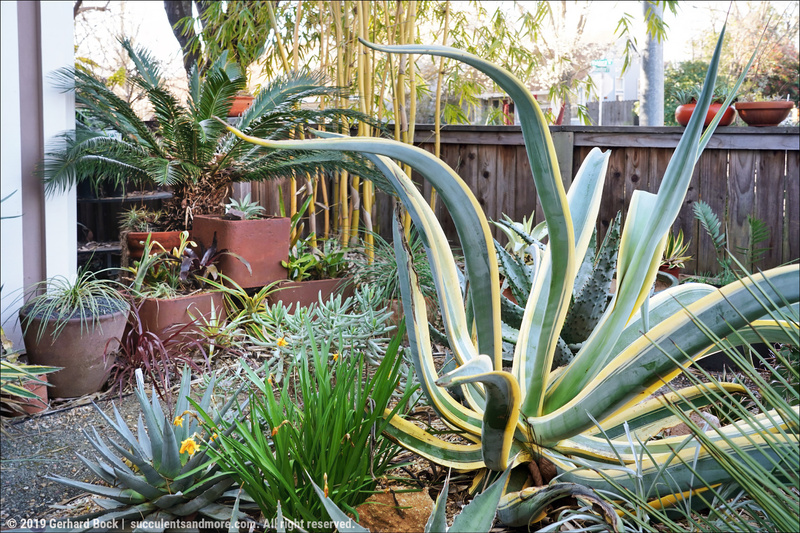 And as you say, they'll be kind to desert plants too. Win/win! DIY and I have had a rocky relationship over the years. I'm clicked we finally clicked! Great idea! They look good and that the plant can send its roots into the ground is good for the plant, too. That's what I was thinking. Less worry about watering, too.